With either just two or three people lunching in per week or when hubby is out of town, I usually enjoyed preparing one dish meal. Another reason is also it is easier to feed my little one as she tends to eat slower than the rest of us or when I am out of time preparing a full meal. I was thinking about crabmeat fried rice for a few days. 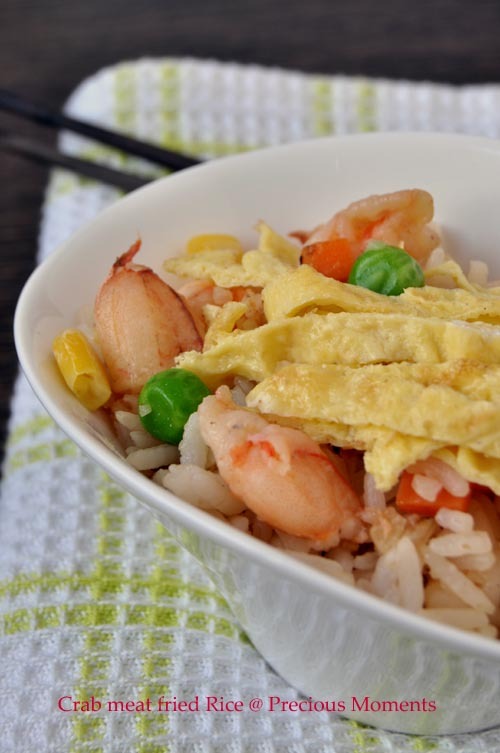 Remember once there was this famous stall that sells S$12 for a plate of fried rice? I guess now the price could have already gone up 2 folds or more. You won't catch me buying live crab and digging out the flesh as firstly, I can't tell whether fresh or not, secondly, killing it somehow needed a lot of courage. So it is always the ready packed version if I needed crabmeat. The last time my experience wasn’t good. The meat was full of shells and it is really yucky eating it. This time round, I bought crab leg instead. After thawed, I was a little worried that it is mushy and seriously my worry was unfounded. For my Crabmeat fried rice was really good. Best of all, hubby stepped in after work and commented that something smelled good. Yea, a brownie point for me! Another busy Friday for me. Marinate thawed crab legs with sesame oil, soya sauce, pepper and set aside. Heat wok well and add in oil. Sautee minced garlic till fragrant. Add in rice and mix garlic well. Add in beaten egg to coat rice. Add in crab legs and corn mixed loosely with the rice. Turn off heat and add in green pea. Season to taste with either a dash of soya sauce or fish sauce. can just get crab legs over there? pass one plate over her, pls!! Thanks Quizzine! I once ate a really yummy crab recipe. Can't wait to learn how to pick and kill crab to make that dish! Lena, it is frozen and can be found easily in Singapore supermarket. If I go KL, I pack one for you. I've been thinking about crabs a lot lately. Now I feel like eating crabmeat fried rice too!